Last week we invited Buxton library’s non-fiction reading group and the Friends of the Museum to a curator led tour of the ‘Revealing the World’ exhibition. The event was to celebrate the launch of the paperback ‘A history of the World in 100 objects’ and Penguin kindly donated 10 copies of the book for us to give away. The aim of the event was for the group to choose their favorite object in the exhibition. I was slightly surprised by their choice which beat objects such as an Egyptian pyramidion, Nawhal tusk and Inuit canoe. The object they chose was not the oldest, nor the most historically important or even the rarest . Instead the object was chosen because of its beauty and meticulously painstaking production. 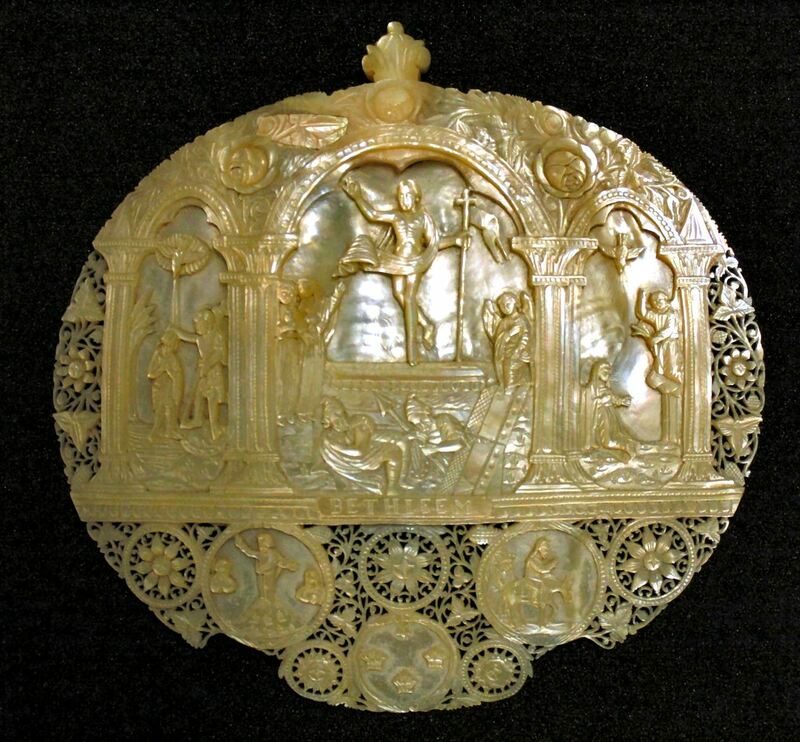 The group chose a mother of pearl carving depicting scenes from the life of Christ. The carving made in Bethlehem, dates from the 18th century and would have been an early tourist souvenir. The object was chosen because the group “loved the superb intricate carving and detail”, and the skill and “intricacy of the craftsmanship and reflection from the material”. By the early 19th century the Middle East has become an adventurous addition to the usual Grand Tour, with tourists attracted to the area because of its biblical heritage and ‘Eastern’ culture. By 1869 Thomas Cook were even offering a tour to the Holy Lands. Artist were drawn to the area and another object in the exhibition which was a runner up with our group was a sketch of Sinai drawn by Edward Lear (1812 – 1888). The group liked the simplicity of the sketch and felt it was very ‘evocative of the desert’. We don’t know how or when the Bethlehem souvenir came to England but before the museum acquired it in the 1970s it belonged to Randolph Douglas and was displayed in his museum ‘The House of Wonders’ in Castleton. Douglas was an extensive collector following in the footsteps of the 18th Century collectors and their cabinets of curiosity. He opened his House of Wonders in the early 1920s and it soon became an intriguing attraction for visitors, who were guided around by torchlight.